A brief history of the Simpson Logging Company railroad - Pedal The Rails! 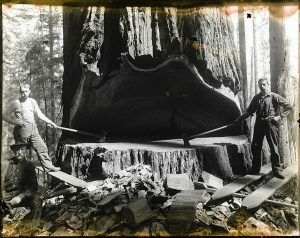 The Simpson Logging Company operated and maintained an extensive network of 80 miles of track used to haul timber out of the surrounding mountains and to the mills in Shelton. These rail lines were in continual use for 120 years and became the last privately owned logging railroad in operation in the continental United States. 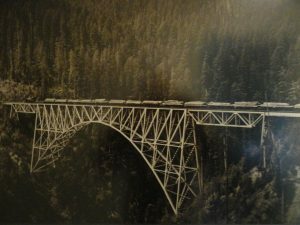 The High Steel Bridge and Vance Creek Bridge were part of this rail system and constructed in 1929 at the request of the US Forest Service (USFS) by Simpson Logging Company with contractors from American Bridge Company, part of the U.S. Steel Products Company. These impressive steel arch rail bridges were built to reach timber in the southern portion of the Olympic Mountains. The two bridges are among the highest railroad bridges built in the world. Vance Creek Railriders take their name from the bridge that was once part of Mason County’s rich logging and lumber history. The Vance Creek Bridge has been decommissioned, but the High Steel Bridge was converted to a road in 1955 and is still in use as a truck haul route over the Skokomish River. The portion of track Railriders pedal along includes diverse trees and plants along with recently logged sections, ponds and low bridges over Goldsborough Creek. This was the route to town and to the mills which converted logs to lumber for diverse markets to build our great nation. The beauty of the area can be enjoyed as you pedal in the fresh air right down on the rails, listening to the gentle thump of the rail sections right under your feet.